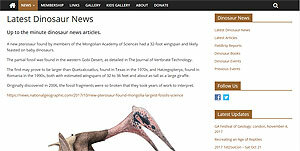 If you have an interest in palaeontology then check out the new page at The Dinosaur Society. It features all the latest dinosaur finds and news. We produced this page for the society by linking their facebook page to their main website – they only have to share a post on facebook to then have it published on the site, with one easy click. Not only convenient, this allows their efforts on social media to be indexed and listed by search engines, to encourage wider use of their content and an increase in participation by their members and the public. The Dinosaur Society is a charity aimed at encouraging an interest in dinosaurs and palaentology in old and young alike, running events, fieldtrips and competitions throughout the year.